I used to be quite the mystery reader, having cut my teeth on the Hardy Boys and Sherlock Holmes stories while still in grade school, then progressing through Agatha Christie, John D. MacDonald, and Dashiell Hammett in high school, to Rex Stout, James Ellroy, James Crumley, Robert Parker, Sue Grafton, and Andrew Vachss in college. But sometime in the early 90s I jumped off the mystery train, as well as curtailing my science fiction and fantasy reading, largely in favor of jumping around from new interest to new interest. While there would be an occassional genre book, it was usually due to a choice of authors (I tend to read every new Iain Banks, Pat Cadigan, or Jonathan Carroll book that comes my way). And this is why I had missed Ian Rankin’s series of Scotland police procedurals featuring John Rebus, which I’ve discovered has quite the following, and after trying this novel from the middle of the series, I can easily see why. Perhaps it was my lack of mystery reading for awhile, but this book sucked me in about 30 pages into it, and I kept looking forward to reading more–which is something I can’t say about too many recent books I’ve read. I picked it up because we’re traveling to Scotland for holiday next month and we try to read the literature recommended by the guide books before we go. Rankin’s Edinburgh and Aberdeen, as described in this book, is not likely any place that we’d want to visit, the general feel for Scotland as a place different from the States does come through. The majority of this book concerns oil platforms out in the North Sea, and Rebus does get to visit the Shetlands, which we won’t get to see, even though we’d like to. Rankin also, like James Ellroy in The Black Dahlia, uses an actual murder case as the core of the book, then layers on additional mysteries that both inform and interact with the facts as generally known. 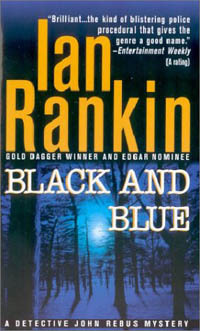 And, because it’s a police procedural, a quarter of the book is concerned with how Rebus is shafted into an ugly assignment as well as hounded by a news magazine for a previous conviction that might have sent an innocent man to jail, that ends up opening an internal police investigation into his and his partner’s methods. This is the kind of thing that Ed McBain made popular, but Rankin’s take on it is slightly less by-the-numbers and, as such, seems a little more real. I enjoyed this tremendously and am seriously considering reading the whole Rebus series from the beginning–I’m just not sure I can do that in the next month before we leave to visit Rebus’s stomping grounds.